The Continental European Division of the International Association for Dental Research (CED-IADR) is excited to announce the opening of the ScholarOne Abstracts submission site for the CED-IADR/NOF Oral Health Research Congress (19-21 September 2019). Review the Call for Abstracts prior to beginning your abstract submission. All abstract submitters, member and non-member, will access the site through the Members Portal of the IADR web site. If you are not a member, you will need to create an account in order to submit an abstract for presentation consideration. NOTE: Creating an account for abstract submission does not equate to becoming a member or renewing membership to the IADR/AADR. This is a separate action. 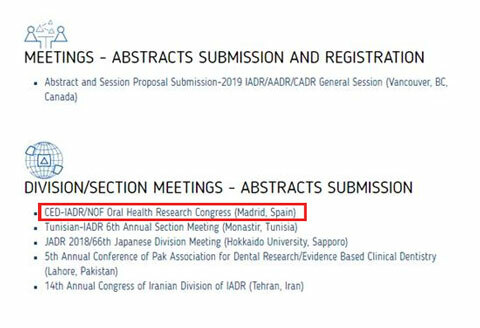 Upon creating your account and logging in at https://iadr.org/My-IADR, please find the link to submit your abstract in the area of the website below. This action will take you directly to the ScholarOne Abstract submission site.